If you had fun during the recent Red Wine and Chocolate Tour, mark your calendars for the upcoming NW Wine & Cheese Tour, April 14 and 15, 2012. Save the date! The NW Wine and Cheese Tour takes place April 14 and 15, 2012. Olympic Peninsula Wineries will serve a selection of local, artisan cheeses alongside new releases of red and white Washington State Wines and hard ciders. Visit one winery/cidery, or visit all eight participating Olympic Peninsula wineries in Port Angeles, Sequim, Port Townsend, and Chimacum. Expect to savor cheese from Mystery Bay Farm, Mt. Townsend Creamery, Whiskey Hill Farm, Pleasant Valley Dairy of Ferndale, Willapa Hills Farmstead, Gothberg Farm, Golden Glen Creamery, and Samish Bay Cheese Company. Bring your appetite and a designated driver! Now that Thanksgiving is behind us, it’s time to start considering Christmas and Hanukkah. This year, gift a gift that can be truly enjoyed. Give a bottle of Washington State Wine from the Olympic Peninsula. Give special gifts this year. Give Washington Wine made on the Olympic Peninsula. Find the perfect wines for the oenophiles in your life by attending our Holiday Open House. 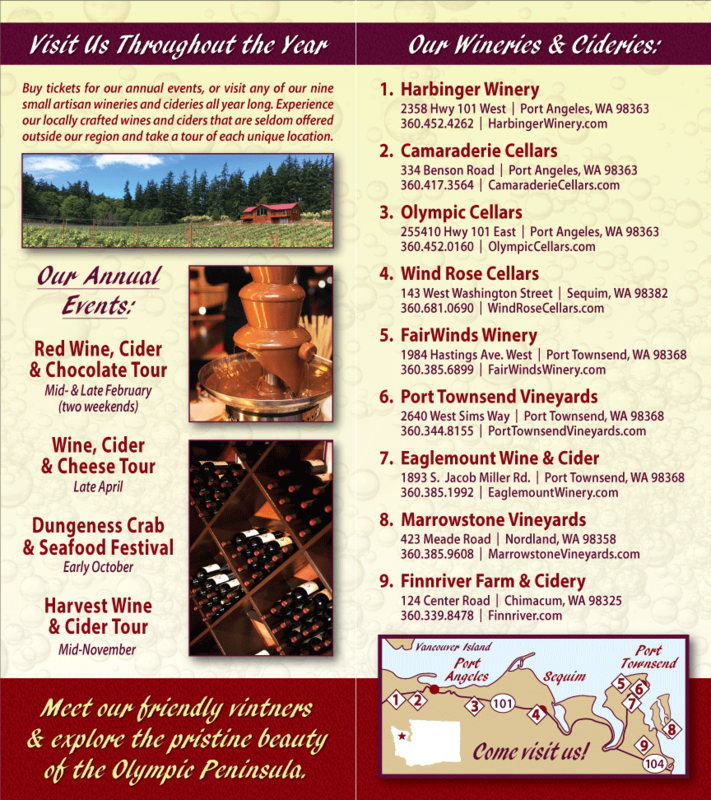 All eight of our Olympic Peninsula Wineries and Cideries will be open from noon until 5 p.m. on December 10 and 11, 2011. Make a weekend of it (holiday shopping need not be dreary), and visit all of them. Take your time. Stretch your legs at beautiful, rural, Eaglemount Wine & Cider and Finnriver Farm & Cider. Spend a few hours at the Port Townsend wineries, Sorensen Cellars and FairWinds Winery. Pass the night in Port Townsend, where you can enjoy an excellent meal at Fins Coastal Cuisine or The Silverwater, then head to Port Angeles on Sunday, where you can leisurely taste at Olympic Cellars, Black Diamond Winery, Harbinger Winery, and Camaraderie Cellars. You may even want to make a long weekend of it. If you know your oenophiles to have certain preferences, talk to the pourers at the various wineries. They’re in the best position to help you find the right wines. Won’t it feel good to have your holiday shopping finished by the 12th? Bring your own glass to the 2010 Harvest Wine Tour of Washington State Wineries on the Olympic Peninsula. The amazing taste of fall. Our Harvest Wine Tour takes place November 13 and 14 from 11 a.m. to 5 p.m. at all seven member wineries. This is a great excuse to head to the Blue Hole in Sequim, which will probably be in high demand come mid November. Olympic Cellars on the road to Port Angeles, and Camaraderie Cellars and Black Diamond Winery in Port Angeles will serve an assortment of autumnal appetizers alongside their wines. The Olympic Rain Shadow stretches to scenic Port Townsend, where Sorenson Cellars and FairWinds Winery will serve their finest Washington State Wines and FinnRiver Farm and Cidery will amaze you with their delicious hard cider. Tasty treats will accompany the wines. For extra fun, each winery will host a scavenger hunt for wine-related items during the weekend. This is a self-guided tour: start in Port Angeles and work your way to Chimacum, start in Port Townsend and work your way back, or criss-cross the peninsula. Your itinerary is up to you. 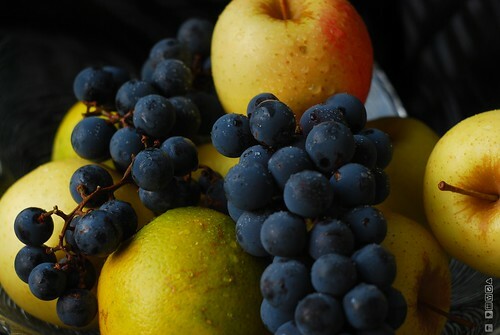 Our wineries supply outstanding Washington State wines and ciders, food, and fun. Tickets for this self guided tour are available in advance or at the door on a first come basis for $25.00 and entitle you to complimentary wine tastings and appetizers at each winery during the weekend. A tasting fee of $5.00 per person per winery will apply to non ticketed visitors. For additional information and tickets, please visit our Harvest Wine Tour page.